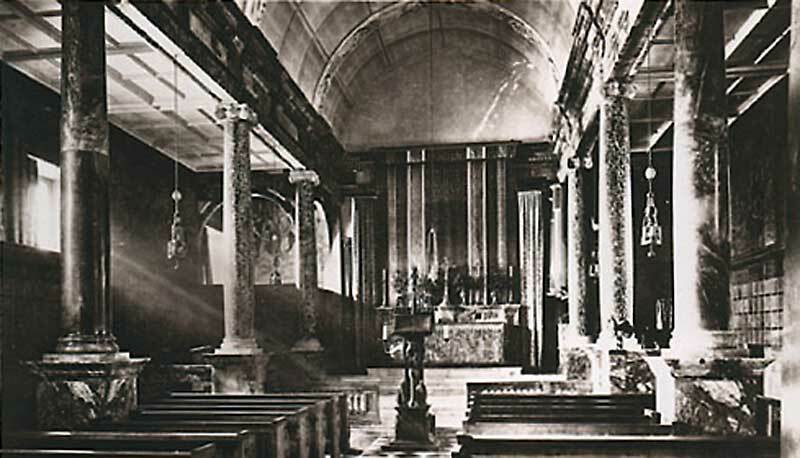 The chapel is in the Old Riding School, now part of Welbeck Abbey, a predominantly 18th century house built on the site of an earlier Premonstratensian monastic property founded in 1153-4, and recognised by 1512 as the head house of the order in England. Little of the monastic house survives. 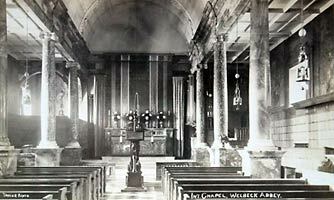 The chapel was built in the 1890s to designs by Sedding drawn in 1889. The fifth Duke of Portland having built a new Riding School, the old Riding School (by Smythson), which was part of the house, was redundant, and was divided into two, to form the Titchfield Library at one end, and the chapel at the other. During the First World War the kitchen block was used as an army hospital, and after the Second World War the seventh duke leased Welbeck to the Ministry of Defence which operated it as a training college known as Welbeck College. For many years the house was used by the army as a school, and the chapel was in regular use, but since they finally vacated the building in 2005 few services have taken place, except for carol services at Christmas. The chapel has been maintained but little used. This entry was compiled by John Beckett following a visit to Welbeck. The chapel is open only by appointment, and no photography is allowed.